BBC: BBC Parliament is now encrypted in BISS (11495.00MHz, pol.V SR:44100 FEC:9/10 SID:4736 PID:601/602 English). 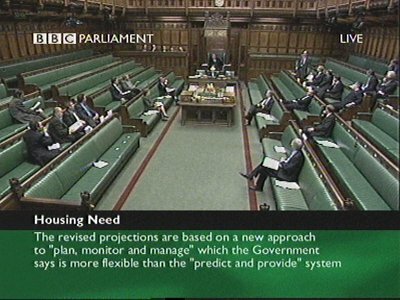 BBC: BBC Parliament (United Kingdom) is now transmitted Free To Air (11495.00MHz, pol.V SR:44100 FEC:9/10 SID:4736 PID:601/602 English). Sky Digital: New frequency for BBC Parliament: 10788.00MHz, pol.V (DVB-S SR:22000 FEC:5/6 SID:10307 PID:5100/5101 English- Clear). BBC: New PID for BBC Parliament: PID:5301/5311 English SID:6705 (11954.00MHz, pol.H SR:27500 FEC:2/3 - Clear). BBC: New PID for BBC Parliament: PID:2305/2306 English SID:6705 (11954.00MHz, pol.H SR:27500 FEC:2/3 - Clear). BBC: New frequency for BBC Parliament: 11954.00MHz, pol.H (DVB-S SR:27500 FEC:2/3 SID:6705 PID:1201/1211 English- Clear). BBC & Sky Digital: New PID for BBC Parliament: PID:2327/2328 English SID:6902 (10847.00MHz, pol.V SR:22000 FEC:5/6 - Clear). BBC & Sky Digital: New frequency for BBC Parliament: 10847.00MHz, pol.V (DVB-S SR:22000 FEC:5/6 SID:6902 PID:2331/2332 English- Clear). Sky Digital: New PID for BBC Parliament: PID:2306/2308 SID:7300 (12129.00MHz, pol.V SR:27500 FEC:2/3 - Clear). Sky Digital: New PID for BBC Parliament: PID:2307/2309 SID:7300 (12129.00MHz, pol.V SR:27500 FEC:2/3 - Clear).